When you are considering a remodel of your home or are thinking of renovating your place of business, look no further than Superior Remodelers for help. We are the premier remodeling and renovation company in Newtown, CT and we offer a long list of renovation services for businesses and homeowners in the area. Choose from our long list of residential and commercial remodeling services or talk with our specialists to find out what we can do for you and your property. As a BBB accredited company and a FEMA approved business, you can rest assured that no matter what construction and renovation work you need to have done, we are more than capable of handling for you. As a licensed residential and commercial contractor, we can guarantee that what we do for you will always be of superior quality. You can rest assured that we have the people, the equipment, the years of knowledge, and the drive to give you the best possible services we have. Window Installation – give your home a new look and improve energy efficiency with the right windows. Siding Installation – choosing the right siding will not only make your house look amazing but will also help improve insulation too. Roofing Installation – have a new roof installed or repair an existing roof with the help of our roofing experts. Spray Foam Insulation – proper insulation not only makes your home more comfortable. It also helps reduce energy consumption and makes it more energy efficient. Radiant Barriers & Reflective Insulation – keep conditioned air within your home better and keep out the heat of the sun with the use of reflective insulation and radiant barriers. Gutter Guard Installation – you don’t have to worry about debris and constantly cleaning your gutters when you have a gutter guard installed. Hidden Doors – add some mystery to your home and create a private space for yourself with the help of hidden doors. New Flooring – create better-looking rooms with new flooring from our selection of flooring options. Railing Systems – don’t settle for bland looking patios and decks. Add a little something extra to these parts of your home with new railing systems. Other services that we also offer include sauna kit installation, steam shower installation, garage storage solutions, and attic storage solutions. Need new your basement windows? We can also do this for you. Does your home require hailstorm repairs? We can also do this for you. When you need to have repairs and renovations made but don’t have enough cash for it, don’t worry. We have you covered. Avail of our budget-friendly financing offerings and get the renovation and remodel you need done asap. Contact any of our consultants and ask about our 0% financing options. 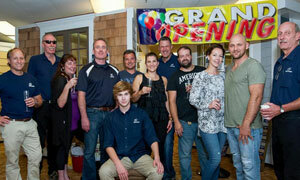 Whether you need commercial remodeling or home renovation, in Newtown CT, the company to call is Superior Remodelers. We are committed to serving you with our long list of home remodel and commercial renovation offerings. We are proud to have not only some of the best people onboard but also use updated methods and equipment to safely get things done. Don’t hesitate to contact us today to get your remodel started. Call us at 888-330-8148 and schedule a free assessment today. We removed the old insulation, disposed of it, then vacuumed out the area to make sure it was clean. We then sprayed 5 inch spray foam in place of the old insulation. Looking to have 8 skylights and roofing replaced. Newtown, CT. I am contacting three roofers for estimates on my roof. I may ask for estimates on 3-4 windows to be replaced as well, but the roof right now is the priority. Price matters. Also, a no interest payment plan would be great as well, if possible.